As an Online Marketing Specialist, one of the most important things I need to be constantly doing is studying what is going on around the industry of Digital Marketing and SEO. I go through a ton of news sites and marketing blogs on a daily basis just to do this. Juggling through different sites in one browser could be overwhelming though. So, I decided to use Flipboard. I understand that there are a lot of other feed readers that I can use for this matter. But, with Flipboard on my iPad mini, I can view my reading list in a beautifully designed magazine-like interface. I believe it could not get any better than that. 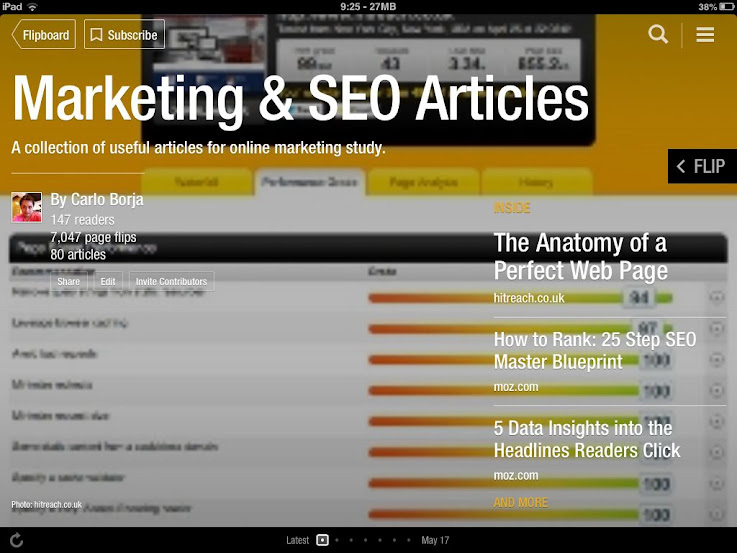 When Flipboard started introducing the feature to create your own magazine, I created my own "Marketing & SEO Articles" magazine. It started out as just my personal collection of articles that are useful for studying topics around online/inbound marketing. But, to my surprise the readership grew. Flipboard users started subscribing to my magazine. It was then that I realized that there were only a few magazines about SEO on the app. It just so happened that I was one of those who created one. In this magazine, I basically just "flip" useful articles from all the trusted blogs I read on a regular basis. I will be constantly updating this magazine as I continue to study different topics around it. You can check out my magazine here: Marketing & SEO Articles. Flipboard can now be opened via the web so you can still view this if you are on your desktop web browser. If you also want to study Marketing and SEO (or if you are just interested in these topics) , you might want to subscribe. I hope you will find this magazine useful. If you love Flipboard or you have a magazine to recommend, let me know in the comments.